When Facebook user Jesse Carls posted a photo of the fast food chain worker last November 30, netizens were surprised that the girl has a striking resemblance to Hollywood actress Chloe Grace Moretz. Carls playfully wrote on his caption that the American actress is working at Jollibee Navotas. It eventually garnered 40,000 likes and shared 3000 times. She was then dubbed by the netizens as “The Filipina Chloe Moretz”. The only difference between the 2 is that the actress is blonde while the other is brunette. Most of them search for her profile and discovered that it is Edcell Ched, a 20-year old working student of Malabon University. 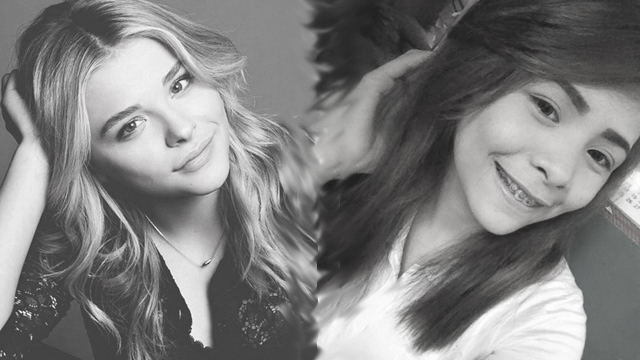 Based on her personal photos, she is indeed a doppelganger of Moretz. It wasn’t only the Filipinos who are fascinated by her beauty but also the foreigners who took notice of her. She was even featured by the international media like Teen Vogue, Mashable and Buzzfeed. They also notice that the last photo could pass as a face swap with Chloe. One netizen even suggested that the 2 must endorse Jollibee together. However some were not convinced with their resemblance. Alyx Reid, a facebook user said that in the work picture they do look similar but otherwise they don’t look alike. Her viral photo grab the attention of the actress who is known for her roles in If I Stay” and “Carrie” and she herself was shocked with their similarities. Based on Moretz tweets, she stated that they do very look alike from the photos of the Filipina beauty in a counter. Edcell on the other hand posted a screenshot of Chloe’s tweets and was overjoyed. She was grateful that the 19-year old actress approved of her and also expressed her gratitude for the increasing fame in social media. In fact, her facebook account was now followed by more than 50,000 users.